Lancaster Castle, also known as John O’Gaunt’s Castle, is a medieval impressive fortress located in the English county of Lancaster, overlooking the town of Lancaster and the River Lune. It is one of Britain’s most significant historic monuments, since it can be said to trace the history of justice, incarceration and penal reform for almost 1000 years, as it played a central role as a seat of justice and a gaol. 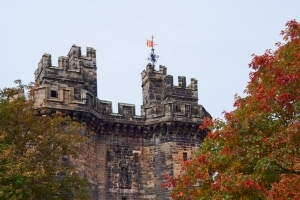 In its role as a Crown Court, today Lancaster Castle deals with the trials of more serious criminal offences, the sentencing of offenders committed for sentence by the magistrates’ courts, and appeals from lower courts. It remains a possession of the Crown, in fact, the Monarch always has the additional title of the Duke of Lancaster. 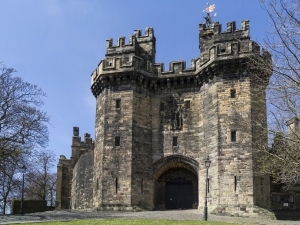 Since HMP Lancaster Castle was decommissioned by the Ministry of Justice and the Castle was returned to the Duchy of Lancaster in 2012, the focus has very much been on the preservation and restoration of the historic buildings, as well as keeping the castle open to the public. The first phase of works focused on making sure that the buildings were weather-proof and water-tight. In 2015, the Duchy further unveiled the restored Victorian clock-tower and re-roofed debtors’ workshops facing onto the central courtyard, In 2016, these workshops were further transformed into a modern office suite for Duchy stuff, and in 2017, it began a significant conservation project which involved the removal of the former Prison Visitors building and the opening up of the former Kitchen Courtyard beyond. The largest medieval building in the castle is the Keep, which is also known as the Lungess Tower. It is four-storeys high, that is, 20 metres, having a shallow buttress at each corner. Its outer walls are three metres thick and there are two rooms on each floor. Although the upper part of the Keep was rebuilt in 1585, the original Keep itself dates back to the 12th century and is the oldest part of the castle. Although the Keep is the largest medieval building, the Gatehouse is the most impressive. It has two semi-octagonal towers which rise 20 metres above massive sloping plinths as well as a portcullis and battlements built out over corbels. Another very important part of the castle is the so-called ‘Governor’s House’ which was erected between the Gatehouse and the Well Tower in 1788. In 1792, work began on the construction of the prison ward for female criminals. This is a four-storey tower with Gothic windows. The male felons’ prison was built between 1794 and 1796 and extends to the north of the Keep, being cut off from the outside world by high walls. Above it rise three four-storey towers with canted fronts and Gothic windows, where prisoners slept in separate cells. During the 19th century, the so-called ‘A Wing’ was also added to function as a male penitentiary. It has 18 cells per floor and extends over three floors. The castle also contains the ‘Debtors’ Prison’ which was built between 1794 and 1796 and is a two-storey accommodation above which there is an open arcade with Gothic arches, giving access to the Castle’s main courtyard. There is also a dungeon basement containing a number of prison cells, as well as the Crown Court and Shire Hall. The Crown Court is oak-panelled and still features the original branding iron used on ‘malefactors’ appearing in the dock. This consists of a metal holdfast designed to immobilise the wrist and fingers, whilst a red hot branding iron embossed with the letter ‘M’ was applied to the brawn of the thumb. This identified the convicted person as a ‘malefactor’. The branding iron was last used in 1811. The courtroom is still in use today. The Shire Hall is a ten-sided room whose construction was completed in 1800 and which sports a semi-circle of Gothic pillars which support a timber ceiling, as well as the arches of a plaster vault. It is still in use as a working courtroom on rare occasions, and displays one of the UK’s exhibitions of chivalric heraldry. 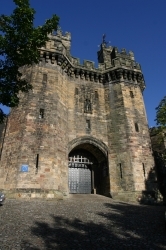 The last major extension to Lancaster Castle was the Female Penitentiary, which was built in 1821 and consists of five tiers of cells, each with a window. The Well Tower, also known as the Witches’ Tower is much older, since it was built in 1325 and contains two wells and three stone-flagged underground dungeons, where the Lancashire Witches were held prior to their trial in the castle in 1612. A large-scale refurbishment of the castle has been underway since 2011. The latest phase will open up the former prison kitchen yard, and is due to be completed in 2019. This will create a new café and teaching centre within the castle complex. The castle is currently open to the general public free of charge, although entrance is only permissible via an official guided tour. There is an exhibition which allows visitors to view the cells at their own pace, as well as a varied programme of events throughout the year. This includes theatre, music, dark history tours, as well as children’s activity tours, murder-mystery events, and more. The castle is also known to be a popular spot for ghost tours, since due to its macabre history, legends of supposed ghost sightings abound. Legend for example, talks of the Black Monk of Lancaster Castle, who haunts the prison grounds and is believed to have been hanged at the prison. Another popular ghost is that of the Pendle Witch, or Old Demdyke, who died in one of the cells within the Well Tower. Couples with a taste for the macabre can also opt to get married in the spectacular setting of the Shire Hall, which is a Georgian court building. Lancaster Castle is open 7 days a week (except over the Christmas/ New Year period) from 9.30am to 5.00pm, with guided tours running throughout the day. In winter, tours normally operate from 10.30am to 3.15pm on weekdays and between 10.00am and 4.00pm on weekends. Tour times do however vary and are subject to change. These last approximately 60 minutes.